I’m a life-long resident of Derby, although for most of my career as an architect I’ve worked in Nottingham, Manchester and London. In my experience people in the past have been quick to criticise Derby, but that view has changed in recent years. Derby appears to be standing out more and promoting a strong message. The external perception is very much that Derby is going places. I’m in no doubt that buildings, and more specifically; quality architecture, define and characterise our cities. Derby has lacked high quality modern buildings for many years and therefore perhaps it’s lacked definition. Whilst Pride Park brought many positives to Derby in the mid 1990’s, it also did some damage to the city centre and there isn’t much quality architecture to speak of. Likewise many have been critical of the Eagle Centre redevelopment and it’s impact on the retail centre, but ultimately I think it brings more positives to the city experience and economy than negatives. I’m still disappointed in the grey box planted on top of the centre which accommodates the Cinema. It’s very noticeable as you approach the city and it’s appearance lacks imaginative design. In the last 5-10 years we’ve seen a number of good buildings emerge and this can only be a positive thing. These are the sorts of buildings which stand out and characterise the city. The Jury’s Inn building may not be architecturally outstanding, but it offers an important and previously lacking hotel offer for business and tourism. It also has some decent height to it which I think is positive – although it’s positioning between St. Mary’s church and the Cathedral seems uncomfortable from some angles. The Riverlights/ Bus Station development again offers important modern functions for the city, but architecturally I think it’s a little disappointing. 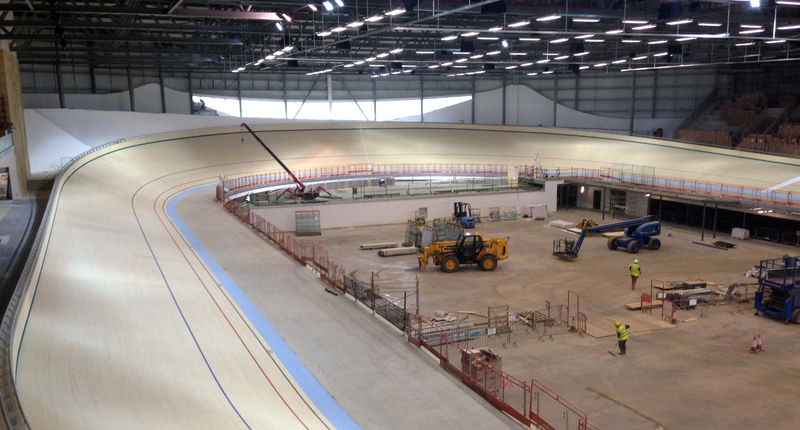 Images above/ below: The Velodrome/ Derby Arena. 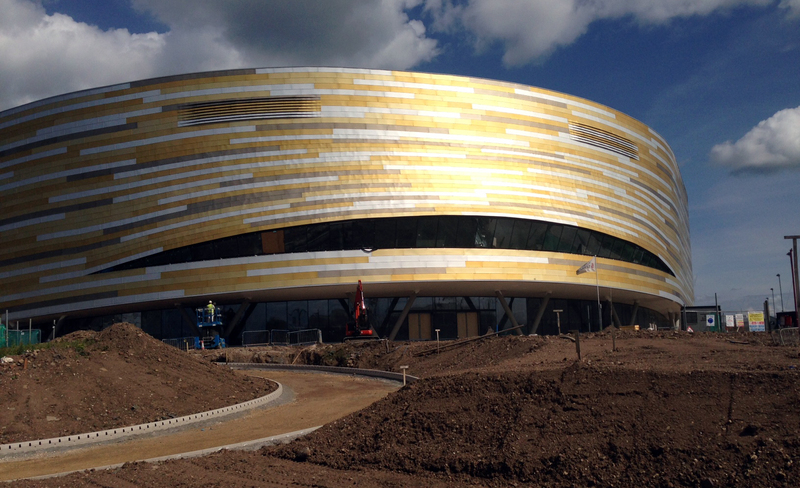 Noteworthy buildings, which the city should encourage more of, are the likes of The Quad, Friar Gate square, Sadler Bridge Studios and of course the shiny new Velodrome. The latter being a strong destination building – and a memorable one at that. 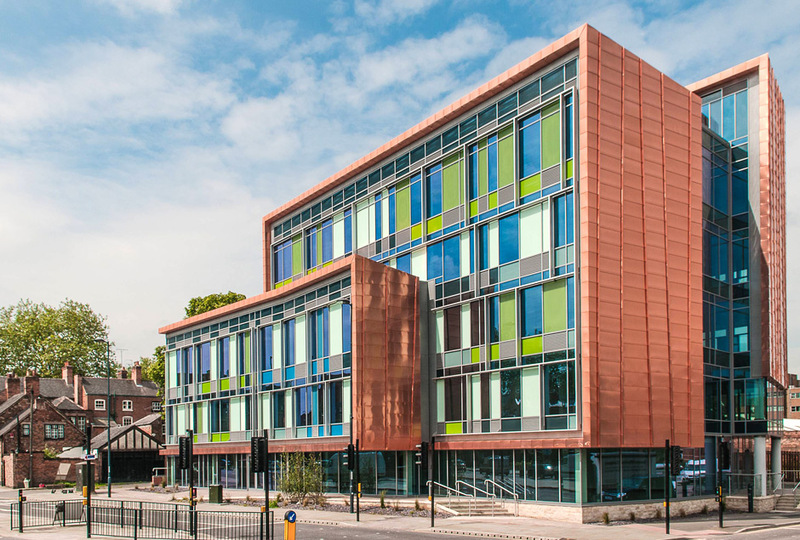 I also think the council have undertaken an impressive transformation of the Council Houses; providing a modern working environment, within a bold, historic and carefully restored building in the City. Image above: One Friar Gate Square. Cities need diversity to function properly. Encouraging City Living is important to this as the needs of people living in the centre are wide ranging and can expand upon a basic retail, food and drink offer. I think Derby should encourage more people to live in the centre. Derby markets itself extremely well economically, better than any other East Midlands city in my view. The ‘Trains, Planes and Automobile’ story is compelling and positively encourages further inward investment which is critical to the City’s economy and diversity. I think Derby has made great progress in respecting and promoting its cultural heritage, whilst focusing on the modern day needs and demands of the City in taking it forward. More quality high architecture will add to that story and further help in defining and characterising what is a great city – with outstanding connectivity. The blog has been a bit hot and cold recently, largely because we are incredibly busy at the moment, especially with new projects in London. I think our success story in the South East is pretty amazing and it’s really got some momentum now. We also continue to be busy all over the UK working across a wide range of sectors. It’s quite surprising to think I’ve been with the business for nearly four months now! I can honestly say I’ve settled in very well and have enjoyed working with new (and a few previous) colleagues. It’s an impressive and efficient set up, with a very focused vision and clear strategy emerging as to how we continue to diversify and build the business. Being part of a different business dynamic has been liberating and refreshing. We have launched a Student Living team. We announced this just over a month ago to coincide with me talking on a panel at a national Student Housing Conference in London. Within the first week we secured our first project in the sector; a 500-bed new-build development in London. More to follow on that in due course. University Business magazine featured our launch. You can see it here. In the last week we’ve been in further dialogue with a client who have asked us to partner with them in taking forward a number of projects in the sector which is great progress. I’ve also started a project with two leading suppliers to develop some new concept ideas which we’ll be promoting later in the year. Our Group Services are doing well. These include; BIM Consult, Environmental, Visualisation and Interiors. We will be promoting these divisions much more going forward as they not only support our core business, but continue to build up independent client bases. Our BIM team have been especially busy and it’s clear to me that there are lots of companies ‘talking’ about BIM, but not that many who properly understand it. We’ve been using BIM for over eight years now and have over 60 Revit users within our circa 120-strong business. If you want to understand more about the benefits of BIM and how we can add value through using, please don’t hesitate to contact us. We have been advising a wide range of sector professionals as well as clients, contractors, sub-contractors and suppliers. Re-brand and new group structure. On the 1st July we will be implementing some structural changes to the business. This will mark a major new chapter for WCEC as we respond to our continued growth and ensure we are suitably structured to allow us to grow sustainably in the future. I suspect there aren’t many architectural practices who can say they have doubled in size over the last few years like we have. This makes us one of, if not the, largest practice in the east midlands. A new website will also be launching soon to reflect our new image and showcase our latest work. As part of our restructure and continued growth we are opening a new office in Leeds very shortly. This seems an obvious move, given our existing connections and client base in that city region. I’ve been asked one quite question a lot recently; “has the move been good for you?” It absolutely has. I’m REALLY enjoying the new challenge. Buildings of Birmingham. Breaking down the Concrete. Firstly welcome to my new-look blog site. I decided it was time for a fresh image. I have to confess I have always struggled to like Birmingham. I can’t really put my finger on what it is, but the City doesn’t appeal to me as much as others (London, Nottingham, Manchester etc). Birmingham was heavily bombed in the second world war, meaning a lot of new development occurred in the 50’ and 60’s; a period defined by concrete structures, with roads dominating and forming very hard divides/ edges. A few years ago I went to a drinks party at Marco Pierre White’s at the top of the Cube. The panoramic views of the city from the top are quite good. However, what this experience really demonstrated was how fragmented the city is; nice pockets, closely bounded by really run-down parts. This is a general theme of Birmingham in my view and perhaps this is why I don’t like it as much. The urban grain of the city doesn’t seem to flow. On a more positive note, Birmingham does seem to have created a bit of a niche for creating bold, contemporary buildings, these help define its character. Most of these buildings challenge the norm of modern architecture. The story starts in the new millennium and here’s six contemporary buildings which are starting to change Birmingham’s concrete image. 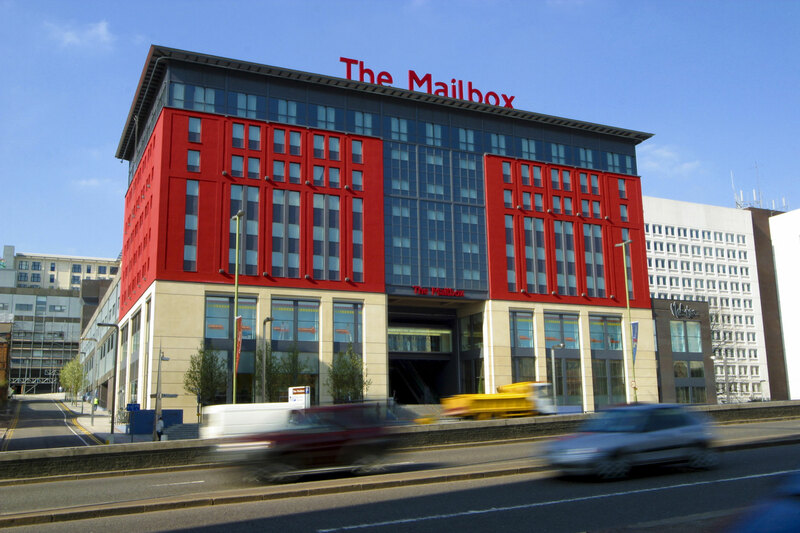 In 2000, The Mailbox was opened; the site was formerly occupied by the Royal Mail Birmingham sorting office. The open-air luxury brand shopping mall has hotels and offices above, as well as the BBC Midlands HQ; a genuine mixed-use development. However whenever I’ve been over the years, the red-fronted mall lacks life and feels more like a ‘route through’, than a ‘destination’. 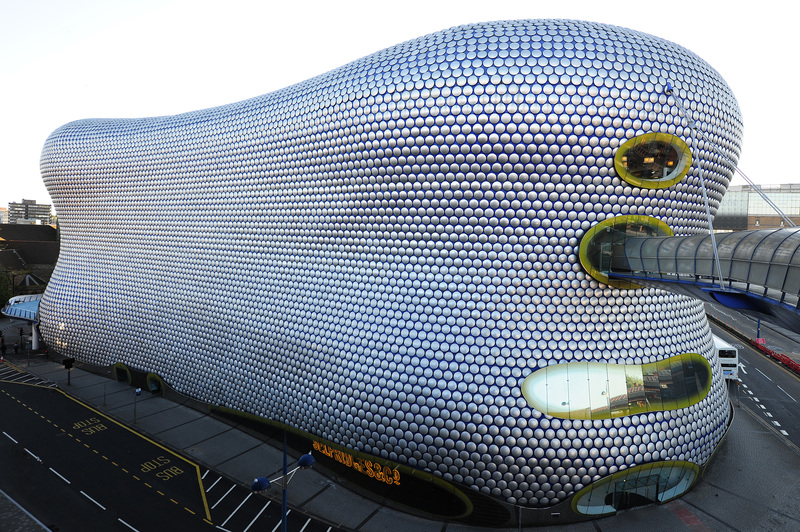 2003 saw the Bullring redevelopment, which included the new £60m Selfridges building; a morphic like, largely windowless building, decorated with domed silver discs. It was certainly bold in its time, and seems to have aged reasonably well. Also the Grade II listed Rotunda building was reinvented by Urban Splash, converting it from offices to Residential. In the same year No. 10 Holloway Circus became the City’s latest (and tallest) building. Designed and built by the same teams as Manchester’s Beetham tower, it takes on a similar aesthetic of predominately glass, with vertical ‘tiger stripes’. However this building is very one-sided and seems to get a little lost in the skyline; it certainly doesn’t provide a focal point like Manchester’s version. The Cube was built more recently, opening in 2010. The 25-storey building is a substantial block, albeit a portion of it is hollow in the centre. The metallic ‘Tetris’ looking cladding doesn’t appeal to me, but again it’s certainly a noticeable building. 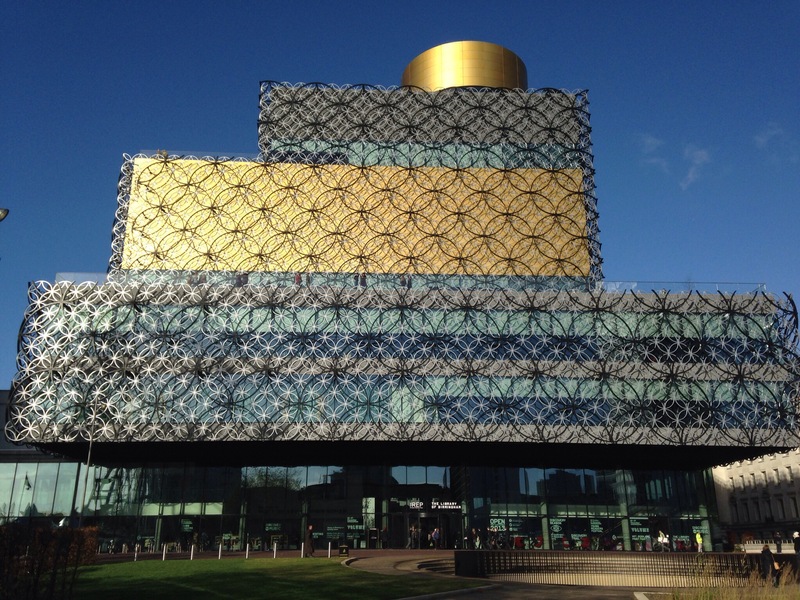 The Library building, by contrast to the others in my view, is a huge success. A truly great example of contemporary architecture; both in its look and use. I think we will see more of these multi-layer buildings emerge in the future. The latest building(s) to emerge in the City is the New Street Station redevelopment (or Gateway Plus), incorporating the old Pallasades Shopping centre, with a new-build John Lewis department store as well. 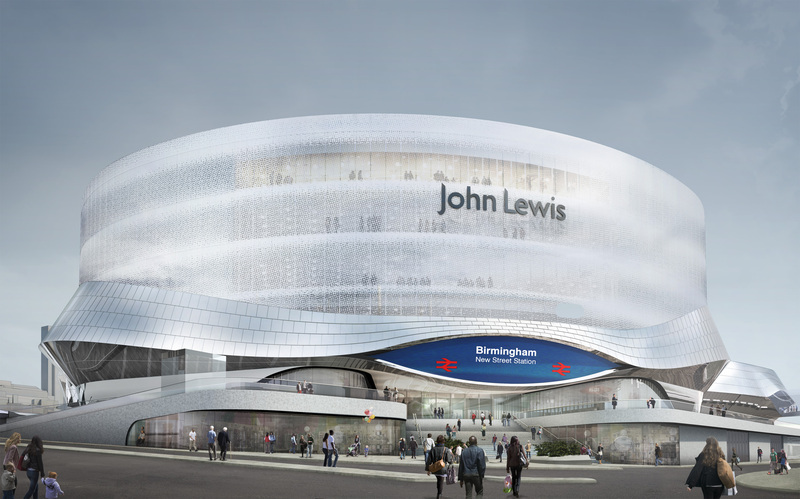 It seems to take cues from the other Birmingham buildings I’ve mentioned here, with curves, glass and stainless steel cladding forming the look. It’s still in construction, but I’m not convinced yet from what I’ve seen to date. Manchester remains my ‘second City’ of the UK and a real favourite in terms of architecture and a city. 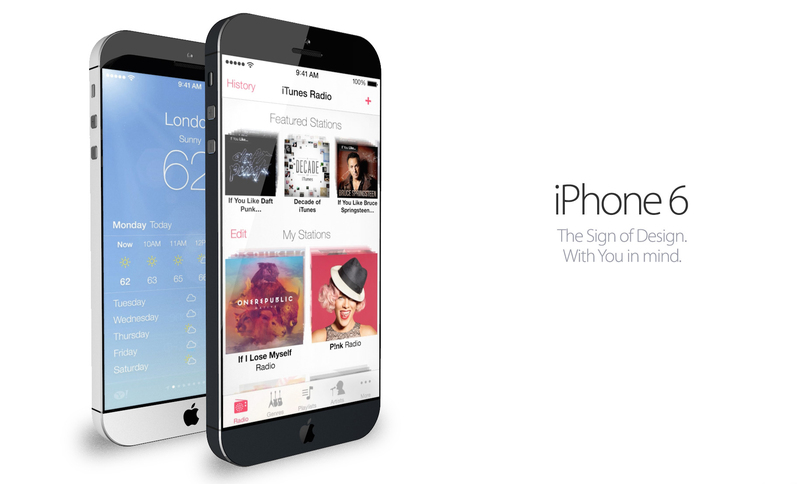 It has also reinvented itself incredibly well from its heavy industrial revolution period. I do applaud Birmingham for recognising the importance of architecture in defining the City. 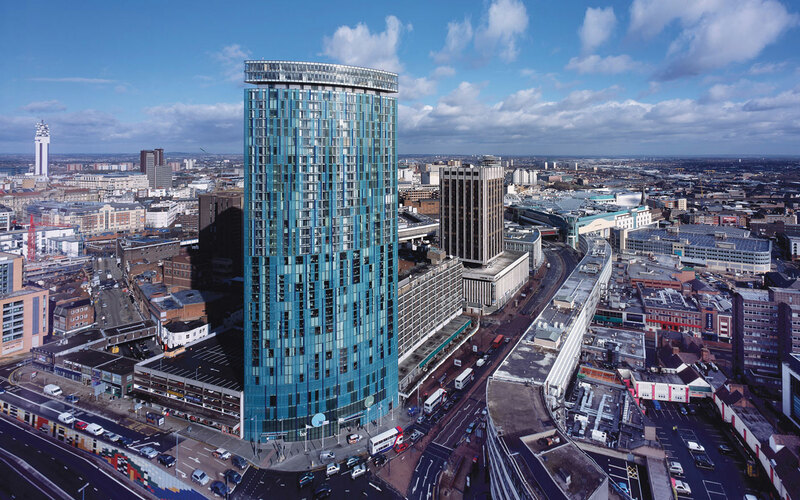 Perhaps the post-war legacy issues of Birmingham are so substantial that it will take many years to re-connect the urban fabric into a cohesive experience. Continuing to break down the depressing 50’s and 60’s concrete will redefine Birmingham’s image. High quality individual buildings are really important for Cities, but so too are the bits between them.